In one Taranaki account the Tokomaru canoe was commanded by Manaia and landed at Tongapōrutu. In a second account, Whata was the commander and the canoe landed at the Mōhakatino River. 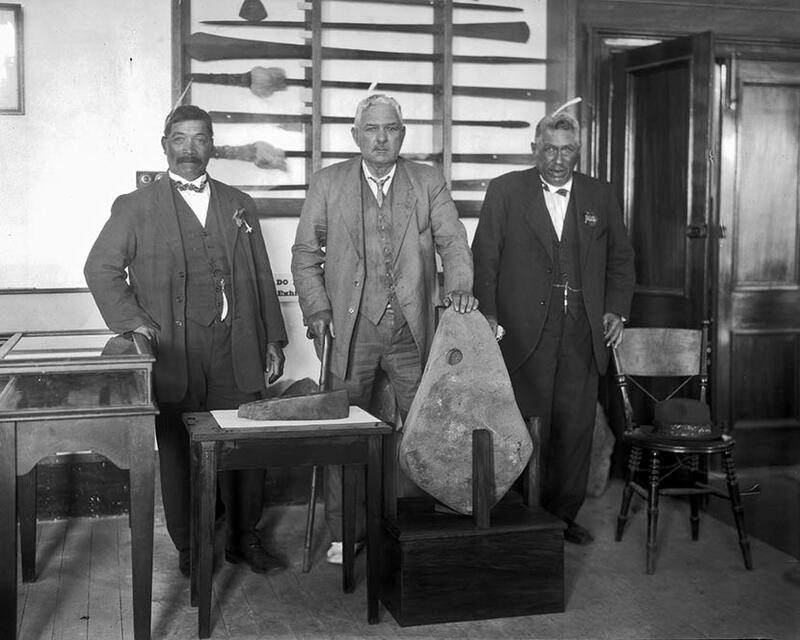 The photograph shows elders presenting the anchor stone (Te Punga a Matori) and the adze (Poutama Whiria) from the canoe to Taranaki Museum (now Puke Ariki) in 1927. From left to right are: Nohomairangi Te Whiti of the Taranaki iwi from Parihaka, Kapinga McClutchie of Ngāti Mutunga from Waitoetoe, and Rangi Matatoru Watson of Te Āti Awa from Waitara.